If you’ve been reading all the marketing info manufacturers put out about red light therapy, you’ve probably noticed how unrealistic some of the claims are. I mean, if all of this were true, why isn’t red light therapy for wrinkles more well-known? I could launch into a opinionated tangent about how a mixture of intellectual property laws and FDA regulations make it unprofitable (and in some cases, impossible) for businesses to sell affordable red light therapy bulbs and devices, but I’ll contain myself. Suffice it to say that without patent protection, there is often insufficient profit incentive for businesses to shell out for the FDA’s costly application and registration fees. And red light therapy itself is not patent-able, as it was discovered by NASA and has been around for decades. Now, what really matters when it comes to red light therapy for skin is: is there scientific evidence showing it works? The answer is yes. A lot of the red light therapy products available make outrageous claims. They say they can erase wrinkles and fine lines, make your skin glow, bring back firmness and elasticity. But do they deliver? Indeed, if a bulb or device is properly designed, it can do all of these things and more. The key is finding a product with the right attributes. And like many things of this nature, results seem to vary from person to person. I’ve received emails from people raving about how much of a difference they could see after one use. I’ve also received messages saying it didn’t do anything for them. Fortunately, out of thousands of sales, I can still count the latter on one hand. Anyway, my point is that in general, red light therapy works for skin rejuvenation, wrinkles, fine lines, thinning skin, sagging skin, enlarged pores, and many other signs of aging. Red light therapy has more than one mechanism of action. Here are some of the effects it has, which are believed to be the reasons that red light therapy works for wrinkles and other anti-aging objectives. It increases circulation to the area, bringing oxygen- and nutrient-rich blood to the skin, which is often a last priority to the body as we age. It encourages the formation of new capillaries. In the short run, this will give you a healthful glow. In the long run, your skin can use this to rebuild and repair itself. Most of us have been told that older skin doesn’t repair…this is nonsense. It just isn’t as efficient and doesn’t have as good of blood flow to power the process. The good thing is that rarely can you go wrong by encouraging good circulation. The one exception that comes to mind is encouraging blood flow to a swollen, recently injured area. Don’t do that without a doctor’s direct supervision. Good lymph circulation is not only good for your health. It’s good for your skin. It reduces swelling and puffiness. If you have Lyme disease/Acrodermatitis Chronica Atrophicans, this is a particularly helpful benefit. There it is…the holy grail of anti-aging products: collagen production. It is reduced the older we get and it can be pretty darned difficult to get it back. Collagen is the foundation of the skin, making it firm, full and elastic. Solid collagen structure is associated with having less (or no) cellulite and with having smooth skin in general. It may take some time- think about 2 to 3 months of consistent red light therapy treatments- but your collagen and fibroblasts can be revived! Remember back in biology class when they said that ATP is the basic unit of energy for a cell? That’s the ATP we’re talking about here. And it matters because ATP is usually the rate-limiting factor in most cellular processes. Without it, skin cells cannot carry out their rebuilding and repair functions. As we age, skin cells get less and less energy. One hugely important effect of red light therapy is that is provides this energy for the cell. Cells then utilize it to spruce things up and get rid of waste…and it shows in your skin. Honestly, the list of potential uses is much longer. That makes sense when you think about how red light therapy works. It gives your cells free energy. Think of all the processes cells carry out. No wonder red light therapy has so many benefits and uses. One of the ways you can test how does red light therapy work is through a professional, such as a dermatologist or aesthetician. Some places to look include doctor’s offices, med-spas, day spas and salons. Some gyms and tanning salons are also now offering red light therapy (I believe I’ve heard that Planet Fitness offers full-body red light therapy). It can be a relaxing, revitalizing spa experience. You can choose someone knowledgeable and skilled at doing or overseeing the treatments. This is helpful if you are new to red light therapy or have a lot of questions. You don’t have to commit. You can try the treatments without buying a product outright. Your bulb or device can be yours alone. If you’re concerned about bacteria, you have direct control over how your product is cleaned and cared for, and whether you allow anyone else to use it. It’s convenient. Personally, I am usually too busy and too cheap to go somewhere and pay someone to lay around for 15-30 minutes and stare at their walls. I’m far happier grabbing my bulb when it’s convenient. It’s cheaper. A lot of pros will try to tell you that their devices are the only ones that work, that their devices are more powerful or that you need a professional to administer red light therapy. I don’t necessarily agree with those statements across the board. What’s more likely is the device’s marketing department has to cook up these sorts of explanations as justifications for the device’s high price tag. Don’t be fooled- look at the facts and numbers yourself to determine if their device really is better than what you could buy for at-home use. Way more treatments. Unless you buy a product with limited uses, such as Illumask, you can get far more treatments if you buy your own bulb or device for at-home use. Let’s skip my personal (overall negative) opinion on the FDA. For the purposes of this section, let’s pretend they are a valid, reliable guardian of public safety that makes sure the best treatments are available to US consumers. 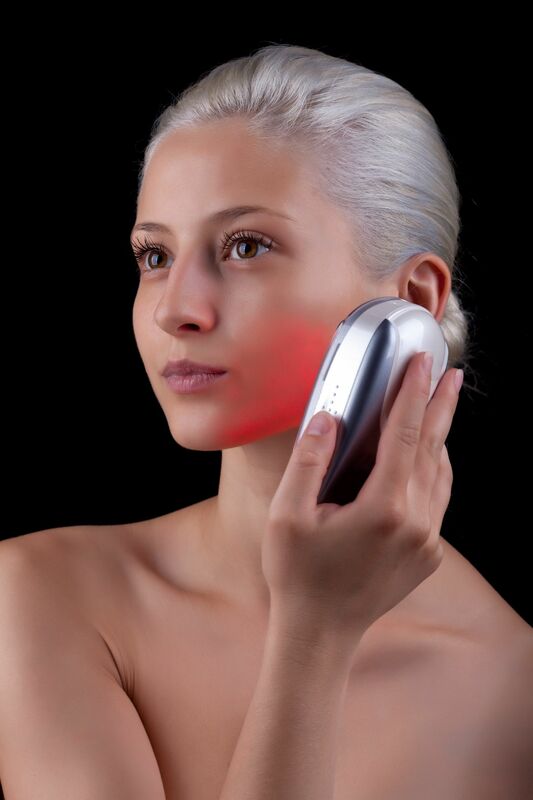 The FDA has approved many red light therapy devices for reducing and eliminating wrinkles. It has also approved/cleared it for many other uses. One of the most common options are relatively small, hand-held devices. These travel well and are usually good for spot-treatment. Compared to larger machines, they can be more affordable. The downsides are that you have to hold them on your skin and you might have to move them around constantly (depending on the device). You can only treat one small area at a time and at that rate, doing your whole face can take a while. Forget about doing your neck or hands or décolleté. A similar option- which is my own personal favorite- is the red light therapy bulb. With these, you have the benefits of hand-held devices, but you can avoid most of the downsides. For instance, they are usually pretty affordable. They travel well. You are free to choose your own lamp type, so you could avoid having to hold it on your skin with your hand. You can choose larger sizes to cover a bigger treatment area at one time. Most of them do not require constant motion. The third most popular option are red light therapy panels. These are often meant for hands-free use and are usually big enough to do your entire face at once. The cons are that they are kind of pricey, take up a lot of space and you can’t travel with them. First you’ll need to wash your skin. It’s bright. You should wear eye protection to shield your eyes from the brightness. Most people report that it feels very calming and soothing. No pain is involved. At no time should you feel uncomfortable. You may be able to accelerate your results by using compatible treatments, such as microneedling or topical application of green tea extract, which has been shown to amplify results of red light therapy treatment. Basically, you just sit there and let the light do its job. I’m sure you’ve been checking out before and after red light therapy photos. But results vary from person to person, so you may be wondering what you should expect from trying red light therapy. Expect results to take time. While some people do see immediate results, most need to do red light therapy treatments for at least several weeks- if not several months. Expect to be looking so hard you miss it. Since results are gradual and happen over time, you might not notice some of the changes in your skin. Be prepared for this and take photos before you start. If you’d like to share your before and after red light therapy photos on RedLightTherapy.US, contact me. This entry was posted in Red Light Therapy and tagged phototherapy, red light therapy for aging, red light therapy for collagen production, red light therapy for crows feet, red light therapy for fine lines, red light therapy for wrinkles by Bambi. Bookmark the permalink.